Citation: C N Trueman "Nikita Khrushchev"
Nikita Khrushchev was the leader of the Soviet Union during the Cuban Missile Crisis of 1963. When Khrushchev backed down and removed Soviet nuclear missiles from Cuba, his credibility was in tatters within the Soviet Union’s political hierarchy and it was only a matter of time before he was edged out of office. Nikita Khrushchev was born in 1894 at Kalinovka near to the Ukraine border. He was the son of a mineworker. Such a background politicised Khrushchev and he fought for the Red Army during the Russian Civil War. After the Bolshevik success in this and with the war ending, Khrushchev became a miner. While working as a miner, he continued his education by attending high school. Khrushchev worked for the Communist Party in Kiev and then in Moscow. While in the capital, he gained a reputation for efficiency and in 1935 Khrushchev was appointed Secretary of the Moscow Regional Committee. He would have needed the support of Soviet leader Joseph Stalin to have held such a post. Khrushchev further enhanced his reputation by being very closely associated with the building of the Moscow Underground – the construction of which was deemed an engineering success and a sign to the world of Soviet skills that were more closely associated with the West. While it was the engineers who were rightly credited with the success of this project, the managerial skills of Khrushchev within such a prestigious project were also recognised. Between 1938 and 1947, Khrushchev was mainly involved in affairs that affected the Ukraine. During World War Two, Khrushchev assisted military commanders fighting there, primarily in the Kursk Salient. Khrushchev was Prime Minister of the Ukrainian Soviet Republic from the time the Nazis were expelled to 1947. In 1947, Stalin selected Khrushchev to reorganise the Soviet Union’s agricultural production. There can be little doubt that Stalin trusted his ability and by the time of Stalin’s death in 1953, Khrushchev was a member of the Communist Party’s Presidium. On September 12th 1953, he was appointed First Secretary of the Party. Such a position allowed Khrushchev to build up supporters throughout the Party’s administrative machinery and to develop his power base. He used his influence to get Bulganin, his nominee, elected as Premier in February 1955. Few doubted that while Bulganin was the political figurehead of the USSR, the man with the real power was Khrushchev. In January 1956, Khrushchev made his boldest move for power. At the 20th Party Congress he attacked Stalin and the ‘cult of personality’ he had developed. The 1956 Suez Crisis diverted the West’s attention away from the USSR for a short time while the USSR’s grip on the Warsaw Pact was increased whenHungary was invaded and the short-lived uprising brutally suppressed. On March 27th 1958, Khrushchev became Premier of the USSR while he continued to hold the post of First Secretary after Bulganin was effectively pushed to one side. 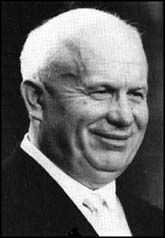 Khrushchev gave the appearance of wanting to introduce a thaw in the Cold War and his appointment was greeted with cautious optimism in the West, especially after the austere rule of Stalin. However, his seeming feelers for peace were mixed with more hostile statements and Khrushchev became a hard man to predict – whether it was taking off his shoe and banging it on a table as he did at the UN to emphasise a point he was making or storming out of an international meeting in Geneva leaving others sitting there without the leader of the world’s second most powerful nation. Yet this was also the man who within his own country went out to meet the people – something Stalin never did. Whether his posturing on the international stage was mere showmanship is difficult to tell – however, it was certainly unusual in an age when diplomatic work was carried out invariably in a genteel manner and ‘by the book’. Whether Khrushchev was a ‘hawk’ or a ‘dove’ is also difficult to tell. After the Cuban Missile Crisis most, if not all, assumed he was a ‘hawk’. However, this may not have been an accurate assessment. Khrushchev, along with many other members of the Politburo, was angered that America had placed military equipment, including B52 bombers, in Turkey. However, as Turkey was a member of NATO, from the West’s point of view, this was entirely legal and acceptable. To the Soviet Union it was provocative behaviour as Turkey shared a border with the USSR. When Khrushchev had the opportunity to counter this by placing medium range nuclear missiles in Cuba, he took it. He argued that they gave the Communist Caribbean island greater protection against another Bay of Pigs incident. During the crisis, Khrushchev gave no indication of climbing down against J F Kennedy. When he did, it greatly weakened his political position at home despite his arguments that he had got America to promise never to invade Cuba. His colleagues in Moscow were also very concerned that the traditional positive relationship between the USSR and Communist China was also deteriorating and that border issues might spark off a Sino-Soviet war. Khrushchev was levered out of office in October 1964 and succeeded by Alexei Kosygin, as Prime Minister, and Leonid Brezhnez as Party Leader. Khrushchev spent the rest of his years in retirement and died in 1971.